Yesterday my season ended after arriving home from China with the England National Team where we achieved some very respectable results and demonstrated good progress. Now my focus turns to preparing for the new season and a new project that was announced on the day I returned. For the development of futsal I have always stressed it needs knowledge sharing and collaboration. Myself, alongside Manchester Futsal Chairman Simon Wright, have created an organisation whose specific aim is this. Its name is Futsal Insights. We are organising a seminar on Saturday 15th July and a practical session the following morning that will feature experts in their respective fields. We have Luca Oppici, a leading sports researcher, who has done an interesting study on futsal in association with UEFA and the Spanish FA and he will discuss his findings. 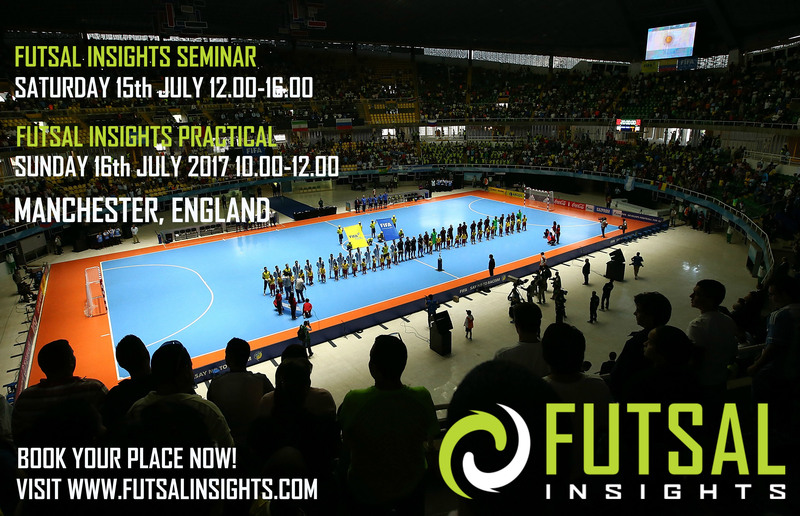 Marc Taylor, an expert on sports strategy and marketing, will discuss what futsal needs to succeed in the UK. Futsal is such an amazing sport yet still hasn´t broken through to become mainstream. I am really looking forward to his insights into how we can effectively communicate to people what futsal offers and how to grow the game. Finally, we will bring World Cup winning player and Inter Movistar B Head Coach Alberto Riquer. He will talk about awareness and decision making in futsal. Probably the most crucial skills in the game and, despite this, sometimes two forgotten attributes, possibly unknowingly, by coaches during training sessions. He will follow this up with a practical session on the same subject the following morning. My first interaction with Alberto was as an opponent when we played against each other in Spain. If there is one element that has led to any achievement in my career then it has been a deep desire to learn which fits nicely with the idea behind this event. It was also why I took notice of what Alberto, who won the World Cup with Spain in 2000, was doing on the court when he was my rival. The main thing I observed was how his eyes darted around the court even when he didn´t have his head up. He was very aware of his surroundings and always took the right decision. He later coached me in England and I learned so much from him. We used to have long discussions on the finer details of the game which I found invaluable and helped my learning even once we were no longer working together. To add to this the fact he has developed as a coach in Spain where training awareness and decision making is at the core of their coaching philosophy, and currently develops players for the world´s most successful futsal club, made him the ideal candidate to discuss this particular topic. The event is not only about the speakers but also the attendees. Futsal has a tight knit community that is passionate but hasn´t fully embraced the benefits of working together. Providing a platform for people to network and discuss the game is going to be a key part of the seminar. I am really looking forward to the discussions that will take place during the seminar and in the social get together afterwards. With the blog I have attempted to present articles, research and opinions that generate discussion and reflection. Whilst the internet provides a great medium to do this and connect with a community dispersed across the world, it cannot replicate the engagement and reward you get from meeting and building relationships face to face. I hope many of you who read the blog will be able to attend and it would be really enjoyable to chat futsal with you and hear your opinions on the game. We have made a huge effort to keep the price as low as possible and it costs just £30 plus you get free entry to the practical the next day which is worth £15 alone. Tickets can be purchased at www.FutsalInsights.com.